SAP has expanded its foray into corporate sustainability with the release of a carpooling application called TwoGo. The cloud-based software uses Nokia’s Here mapping technology and has been in use internally at SAP since July 2011, according to the announcement released Monday. SAP and its employees have derived about $5 million in benefits from the application thanks to lower fuel usage, employee travel reimbursements and other savings, SAP said. 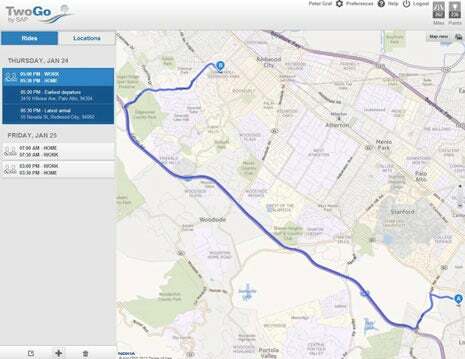 SAP’s TwoGo uses Nokia’s Here mapping technology. TwoGo has benefited SAP’s corporate culture as well, helping to rack up thousands of days’ worth of “networking time” among employees who have used the service, according to SAP. While there are other ride-sharing applications in the market, TwoGo automatically matches up employees who are looking to share rides based on their preferred timing, location and other factors, rather than making users go through lists to find ride partners that fit their schedules, SAP said. It’s also possible for TwoGo users to create carpools with workers at other companies, provided they are also TwoGo users. TwoGo is also usable in conjunction with calendar software that has compatibility with Apple’s iCal, SAP said. Specific pricing for TwoGo wasn’t revealed but the software is available via “affordable” annual subscriptions, according to SAP’s announcement. SAP has made a big push around corporate sustainability in recent years, both from a product perspective as well as by publicizing its own efforts to lower the company’s carbon footprint. There seems to be less emphasis of late from the SAP CEO level concerning sustainability, compared to when Leo Apotheker held that job, said Jon Reed, an independent analyst who closely tracks the company. Still, “I think SAP is very committed to it because there’s an unquestioned financial benefit, and their customers are just as interested in it as SAP is,” he said.